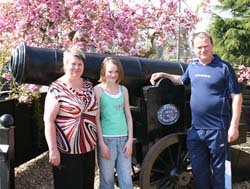 An unusual feature now sits in one family's front garden in Beckingham due to the combination of a lifetime’s desire to own a cannon and also the opportune chance to purchase the replica cannon used to re-enact the arrival of the Sebastopol cannon to Retford in 1858. David and Jenny Hudson, of Old Trent Road, proudly present their new purchase in their garden which has now become something of a talking point in the village. 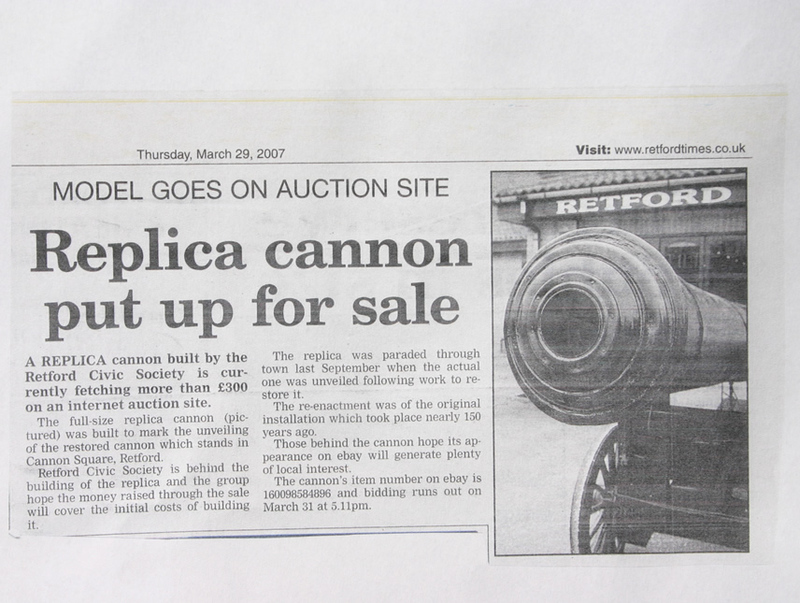 David Hudson has always had a passion for the old style guns and when his wife saw the article in The Retford Times 30th March advertising the sale on Ebay of the replica cannon she decided to bid for it. The Hudson's final bid that won the cannon was £510 and The Retford Civic Society that organised the sale were delighted that the cannon had found a home locally. 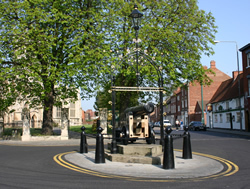 The Crimean cannon in Cannon Square Retford was one of many weapons captured from the Russian army by British soldiers at the battle of Sebastapol in 1855. A number of local men fought in the Crimean War and it was thought appropriate to install one of the cannons in Retford as a permanent memorial. The 1,000lb gun was paid for by leading townsfolk and arrived in Retford by rail from London in 1858.
children while invited guests assembled for dinner and along list of toasts to celebrate the cannons installation, in the Crown Inn (now Litten Tree). It is fortunate that it remains in position today, for when the national collection of metal began during the Second World War the cannon, along with the railings from around St Swithun's Church, were collected and sent to Bradshaw's foundry in the town for melting down. The cannon was saved from this fate by Councillor Alfred Wilson and later reinstated in Cannon Square after the War, and here it has remained as an important landmark within the town. 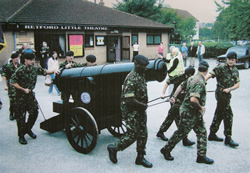 In 2006 the Sebastopol Cannon was taken away to be restored through funds raised by the Retford Civic Society and on 16th September it was re-installed and a day of celebration was held to re-enact the original arrival of the cannon in 1858. The Retford Civic Society had the replica cannon built especially for the occasion and it was pulled through the streets with great pomp and ceremony.